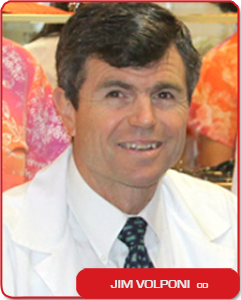 Dr. James Volponi has practiced at Tri Valley Optometry in Livermore (Northern California East Bay Area) for more than thirty years. During this time, Dr. Volponi worked with his father, Dr. John Volponi, to expand services in pediatric vision, specialty contact lenses, ocular surface disease (dry eye) and sports vision enhancement. Dr. Volponi graduated from U.C. Davis (AB Chemistry, 1980) and U.C. Berkeley School of Optometry (OD, 1984). He is a member of the American Optometric Association including the Sports Vision Section, the California Optometric Association and has served as a board member for the Alameda Contra Costa Counties Optometric Association. Dr. Volponi competed as a Division 2 NCAA swimmer at U.C. Davis from 1976-1980 and developed an interest in the high performance and mental requirements of athletes while at U.C. Berkeley. Over the years, Dr. Volponi has worked to improve the sports vision skills of athletes at all levels including high school, collegiate, Olympian and professional. Dr. Volponi and his wife, Maureen, have two sons, Josh and Jake, who are active in many sports including baseball, swimming, water polo and basketball.